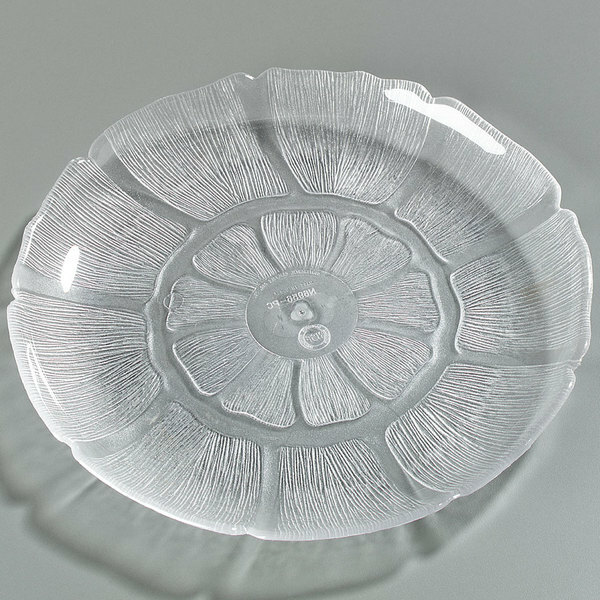 Perfect for buffets, food bars, delis, poolside, and catered events, this Carlisle 6956-807 Petal Mist 9" clear polycarbonate plate is designed for serving and displaying a variety of dishes. Great for your diner, restaurant, or cafe, this plate the ideal vessel for presenting your house-made salads, sandwiches, and appetizers. Featuring an elegant, petal design with a textured exterior, this plate hides scratches while ensuring a timeless, upscale appearance. This plate is made of tough, break-resistant polycarbonate for longevity and an ultra-smooth interior surface for easy cleaning. It's perfect for make-ahead applications, with an incredible -40 to 212 degree Fahrenheit temperature range. Plus, it won't stain, break, or chip under everyday use, making it ideal for high-volume establishments.